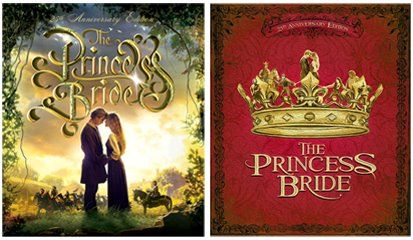 · ALL NEW – TRUE LOVE: THE PRINCESS BRIDE PHENOMENON (Pts. 1 & 2) For 25 years, viewers have watched and loved The Princess Bride. But why does it resonate so strongly for all ages? This two-part featurette offers some answers, along with funny and touching tributes from its cast, director, writer and fans. o Part 1: TRUE LOVE: THE PRINCESS BRIDE PHENOMENON – A Conversation with Rob Reiner, Cary Elwes and Robin Wright. The director and his stars reunite for this lively discussion of the film’s 25th anniversary, favorite fan encounters and memories from the set, illustrated by never-before-seen dailies. o Part 2: TRUE LOVE: THE PRINCESS BRIDE PHENOMENON – Hear from the film’s creators and cast, passionate fans, and see film tributes and parodies, as we explore why the movie became a phenomenon. Interviewees include Rob Reiner, Cary Elwes, Robin Wright, Billy Crystal, Mandy Patinkin, Christopher Guest, Chris Sarandon, writer William Goldman, executive producer Norman Lear, Rob’s father Carl Reiner, and more. Ina new marketing ploy by the studio, we the fans can choose the cover art by CLICKING HERE, which goes to their facebook page. There are two covers to choose from. I like the red one. This entry was posted on Saturday, June 30th, 2012 at 11:24 am	and is filed under Film, News. You can follow any responses to this entry through the RSS 2.0 feed. You can skip to the end and leave a response. Pinging is currently not allowed. « ‘The Avengers’ Blu-ray Detailed!!! That night, I thanked God for seeing me through that day of days and prayed I would make it through D plus 1. I also promised that if some way I could get home again, I would find a nice peaceful town and spend the rest of my life in peace.